I am an avid gamer. Wargames, role playing games – you name it. I’ve been a devotee since – ooh, lessee…. C. 1975. Started out with WRG ancients, Empire of the Petal Throne, and those little brown D&D books. I still run RPG campaigns once or twice a week. I contribute to the things I love. Over time, I have had two RPG systems published. A third system, "DELVERS" is supposedly coming out soon (art by TAB, inspiration from Anime). MWSSK can be downloaded ‘free’ from the Goodies page. “Magical Warrior Star-Soul Knights” is both a celebration and a parody of the anime “magical world” adventure genre. In these stories, a group of ordinary Japanese high-school students are always transported to a magical fantasy world where they find themselves acting as mystic champions serving to save that world from evil. So! Here’s a game system designed to handle this type of campaign. MWSSK has essential ‘anime’ elements designed to give the game the right ‘feel’! This is a game of posing of spectacular attacks and weird magic, recurring enemies and tragic love. The ideal campaign will draw on the best elements of anime shows such as “Rayearth”, “Fushugi Yuugi”, “Escaflowne”, “Those Who Hunt Elves” and “El Hazard”. One secret of this game is that the player characters in effect define their fantasy world and the adventures they will undergo. This little secret makes each game and each group of players a unique experience. DONT think RPG. Think Video Game! Characters should be given gems or power ups. A magical sword actually has three levels of power, each of which is gained only by trading widgets to strange mentors. Oh and did I mention the annoying magical pets? My first RPG. This game was based on the ALBEDO comics by Steve Gallacci. A "hard" SF setting peopled by genetically constructed animal characters. The system has extremely quick, realistic combat systems, and was unique in having systems that simulated character psychology. Second edition ALBEDO included material by Craig Hilton. It was published by Chessex. Supplements included a starship system and two damned cool scenarios – "The Drift" and "Zho Chaka". A rip roaring swashbuckler set in the world of "Mittelmarch" – a world based on our own 1640’s. This was a game of magic and mystery, of musketeers and Machiavellian politics. Cavaliers and Roundheads, Armadas and adventures. The game was unusual in having a card based combat system. As a fencer, I wanted a game system that had the actual cut and thrust of sword fighting. As a writer, I wanted a combat system that could provide a dramatic climax to an adventure (as opposed to the D&D style where endless fights are the meat of the story). Lace and Steel also included psychology systems that simulated love, hate and loyalty – the meat of any good swashbuckling romance. L&S came out through an Australian company called TAGG. A second edition was released by Pharos Press. 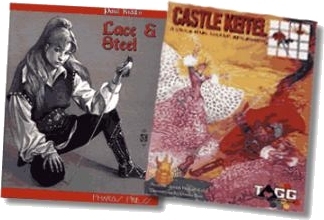 An adventure module, "Castle Keitel" was released by TAGG, but Pharos never re-released this adventure booklet. The Novel "MUS OF KERBRIDGE" was set in the Lace and Steel world. A fan of the "Lace and Steel" game has discovered that the most recent version of the game does not have the maps that were included in the old version of the game. He's put the maps up on his website.